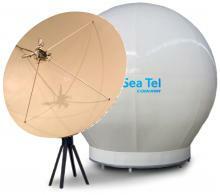 The Sea Tel Model ST144 is the top-of the-line TV-at-Sea™ system. It has always been the choice for the user who needs the largest possible offshore operating area and compatibility with all known and planned satellites. With the major tracking, reliability and stability improvements introduced recently, it is more than ever the antenna system of choice.Available in C-band and Ku-band configurations or “dual-band” configuration that permits the same antenna to be used for both. The ST144 is designed and built to pass the U.S. Navy’s tests for vibration, shock and protection against RFI and EMI emissions. And when it comes to vibration, this antenna actually exceeds Navy MIL-STD-167-1 standards.